Daniel J. Murphy - dmurphy@shawmedia.com Thursday afternoon February 23, 2012 in Crystal Lake. The National Weather Service has predicted 4 to 8 inches of accumulation overnight. 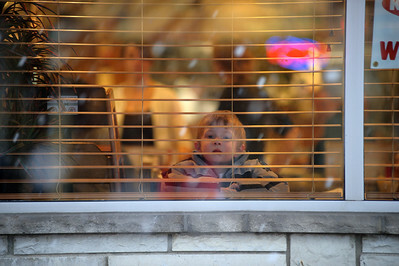 Daniel J. Murphy - dmurphy@shawmedia.com Zach Mason, 4, of Crystal Lake glances at the falling snow from a window at Cafe Olympic Thursday afternoon February 23, 2012 in Crystal Lake. The National Weather Service has predicted 4 to 8 inches of accumulation overnight. Daniel J. Murphy - dmurphy@shawmedia.com Caitlin Goss, 21, of Crystal Lake peeks out the kitchen door of Cafe Olympic to catch a glimpse of the falling snow Thursday afternoon February 23, 2012 in Crystal Lake. The National Weather Service has predicted 4 to 8 inches of accumulation overnight. 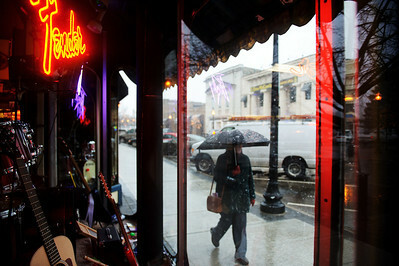 Caitlin Goss, 21, of Crystal Lake peeks out the kitchen door of Cafe Olympic to catch a glimpse of the falling snow Thursday afternoon February 23, 2012 in Crystal Lake. The National Weather Service has predicted 4 to 8 inches of accumulation overnight.